So, many of you have asked about Flat Peyote Patterns. One of our members has given us a link so that we may get a free pattern from her – Spiderwrulf. FREE peyote pattern – Hearts. This peyote stitch pattern with pink hearts is great for Valentine’s Day fans! Make your own simple bracelet with Delica or Toho seed beads size 11. Just a little tutorial on how to make a flower peyote stitch with an odd number (even number is easier). 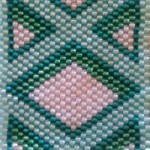 In this video I will show you how to make a beaded needle case using the Tubular Peyote Stitch. In this video I want to show you how to set a teardrop polymer clay cabochon with beads using a Peyote stitch pattern.